Kale doesn’t have to be boring and tasteless! 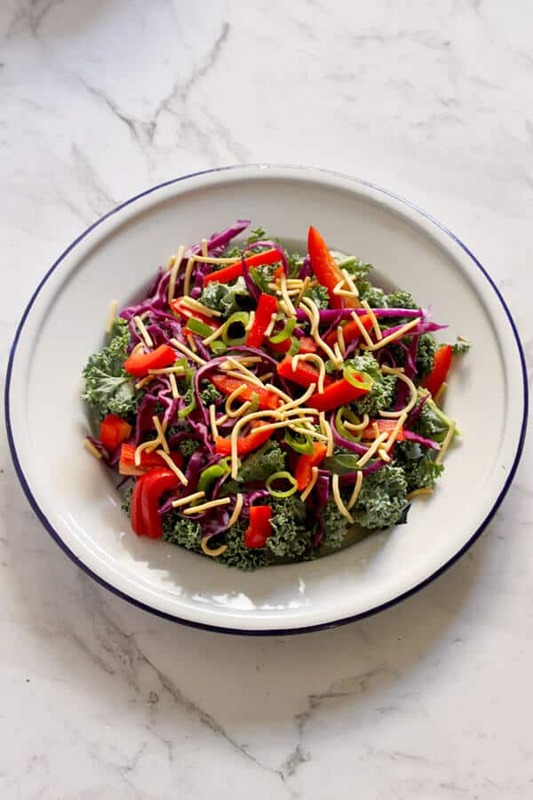 This Crunchy Kale Salad with Lemon Tamari Dressing is delicious and healthy – that’s a thing! So what are you waiting for? It’s funny that one of my most loved salads is this Crunchy Kale Salad with Lemon Tamari Dressing when I used to HATE kale. Well actually, that’s a lie. I tolerated kale in soups and smoothies, but I absolutely despised it in salads. Eventually I realised the problem wasn’t the kale but how it was prepared! You see, you can’t just throw some kale in a bowl and hope for the best. First, you need to massage it. Weird, right? But stick with me. It amazes me how something as simple (and strange) as massaging kale can transform its leaves from bland, bitter and tough to silky and sweet. But it does. And it’s 110% worth the effort. I’m on a mission to ensure no one else has to suffer through a terrible kale salad again! Keep reading below for my guide on how to prepare kale for your best salad yet. Tamari – OR you can use soy sauce instead. Just pull them off with your hands. You can chop but I mostly just use my hands to tear the leaves into small pieces. Move the kale to a bowl and season with a little salt. When I first read about massaging kale my exact thoughts were WTF (and no, not why the face – the other one). But as it turns out, it makes a huge difference! Just grab handfuls of kale and scrunch together, then release and grab another handful. Do this for about 30 seconds and your kale will taste so much better as it turns from rough to silky! Don’t believe me – read this. Work the kale – Prepare the kale using the handy tips above. Mix the dressing – Make the lemon tamari dressing by mixing together in a small jar and shaking vigorously until combined. Toss the salad – Place salad ingredients in a bowl, drizzle dressing over and lightly toss. Serve immediately. 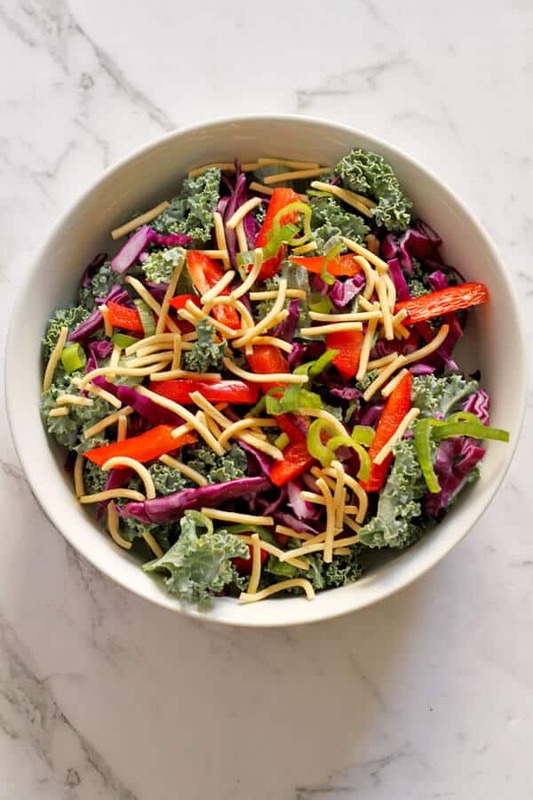 If you are planning on making this salad ahead, leave out the noodles and the dressing until you are ready to serve. If you have leftovers you can store them in the fridge for a day or two, but just be aware that the noodles will lose their crunch. It’s still perfectly edible, just a different texture. 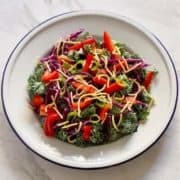 If you’ve tried this Crunchy Kale Salad with Lemon Tamari Dressing I’d love to hear how you enjoyed it! Pop a comment and a star rating below! You can also FOLLOW ME on FACEBOOK, INSTAGRAM and PINTEREST to keep up to date with more delicious recipes. Kale doesn't have to be boring and tasteless! This crunchy kale salad with lemon tamari dressing is delicious and healthy - that's a thing! So what are you waiting for? Prepare the kale following the instructions in Note 1. Make salad dressing by mixing together in a small jar and shaking vigorously until combined. Place salad ingredients in a bowl, drizzle dressing over and lightly toss. Serve immediately. Dressing - The dressing may yield more than 2 serves, so just drizzle over desired amount! Inspiration - Recipe adapted from Fit Foodie Finds. Updates - First published August 10, 2017. Last updated January 29, 2019 with new photos & tips. No changes to the recipe. This looks really yummy! The colors of this salad adds more “deliciousness” in it. Will try your recipe very soon! This salad looks so colorful, healthy and well presented! Great idea for family meals and/or BBQ’s! I had no idea that massaging kale was a thing! Seriously though, this recipe sounds really fresh and delicious + the health factor is a big plus! This looks delicious! I love kale! I actually alwTs keep my stems in whenever I use it. I like the crunch. I never knew about massaging kale! THis looks so delicious. WILL try it for sure. Thank you for sharing this amazing recipe. What a beautiful and bright salad! I have never had tamari before (I don’t think anyway), so I would love to give that a try! This salad looks amazing! I love how colorful it looks and a tasty non-meat recipe. I would love to feature it in my upcoming 7 Day Challenge for my website. Let me know if you’d like to collaborate. Massaging kale is such a great tip. It vastly improves the texture and the taste. I like to use avocado on mine. Not only is this beautiful, it looks delicious. I love a crunchy kale salad! This salad looks so amazing! Healthy with a great crunch and the dressing recipe including lemon and tamari sounds so delish! Take out the tomatoes and I would devour this! But with the tomatoes, it’s so pretty!!! This crunchy kale salad looks so delicious. The lemon tamari dressing would be really refreshing. I am excited to give it a try. I love salad! Perfect side dish for just about anything. I’ll have to save this recipe and make it for the family. You’ll have to let me know how you go! I share your walking zombie feeling. I started a new job and moved to a new house at the same time, two weeks ago. I still haven’t finished unpacking. This looks delicious! It would be perfect for a quick dinner one night or to make a big batch and eat it for week day lunches! Definitely falls into the quick dinner category! I’m on a kale salad roll right now. Lemon and tahini sounds delicious. You can do so many things with Kale! 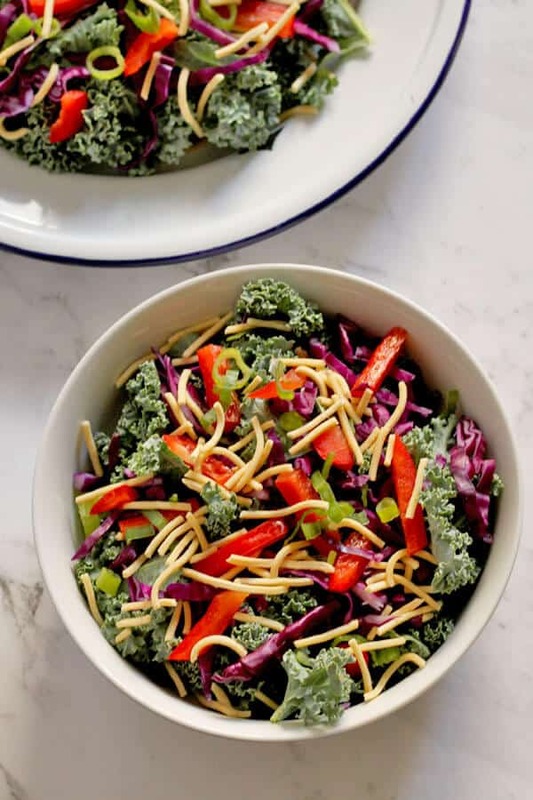 Your crunchy kale salad with lemon tamari dressing sounds absolutely amazing! I love all the pretty colors too! This looks so delicious! Perfect for our End of Summer party! All the colours makes it feel very summery when I’m eating it even though it’s winter over here wahh! Oh, that looks so good. I do love kale, but I always get a little confused about removing stems/massaging. I also love to put kale in my daily juices (I make them in my Vitamix). I always love finding new healthy and yummy recipes for the summer! This looks delicious. Definitely a good salad for summer! That looks so delicious! I would definitely make this, it looks so delicious and I already love Kale. I’ve been enjoying salads lately because I’m trying to get back in shape! I’d love to give this a try as I haven’t given kale much attention. I always use it in smoothies but not in salads! Thanks for the recipe, would love to give it a try one of these days. Thanks AnnMarie – hope you enjoy! I’ve been growing kale in my garden this year. Its nice to have a new recipe to try. The dressing sounds really good. Haha! Try it!! It sounds way more tedious (and perhaps unnecessary sensual?) than it is! It looks amazing! I always want color in my food. Honestly though, I didn’t know you could massage kale. That’s a new concept for me. I don’t know if I know what tamari dressing tastes like…but this salad looks too good to eat. I have been adding more kale into my diet and always looking for more recipes. thanks for sharing. Thanks Ayana! The dressing tastes like soy (which tamari essentially is) and a hint of lemon and sesame! This looks amazing! We can’t wait to try it out. We’ve been looking for new quick/easy/DELICIOUS lunch options for a while! Ever since What The Health was released my husband and I have been in search of healthier food options. Going to give this a try! I haven’t watched what the health yet!